If you have never roasted vegetables, your missing out. These vegetables are the answer to any meat side dish. So what are you waiting for? Look no more here is the side dish of all sides dishes. 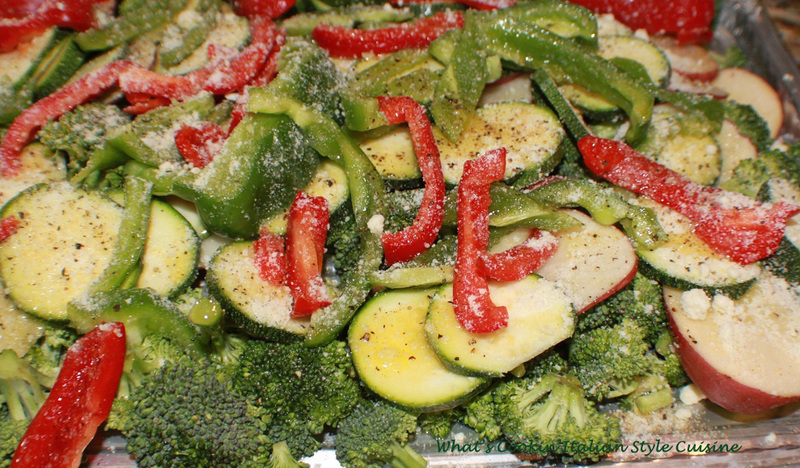 Potatoes, zucchini, broccoli, peppers, garlic, what else do you want to add? You can add what your family favorites are! Other Suggestions Vegetables to use Sliced : portabello mushroom slices, cauliflower florets, thinly sliced carrots, cubed eggplant, tomatoes cubed, okra, thin sliced onions, preboiled green beans, brussels sprouts, sliced tomatoes, thin slices of prosciutto,, sliced italian sausage or pepperoni for flavor for those who like meat! In a large bowl place all the amount of vegetables in it that will fit on your cookie sheet in a single pattern when spread out. In that bowl drizzle around 1/4 cup olive oil, 1 tablespoon minced garlic, salt, pepper, pinch of cayenne powder, 1 teaspoon parsley and oregano. Toss. Lay out on the cookie sheet. Sprinkle generously with Italian bread crumbs then around 1 cup of Parmesan cheese on top of that. Bake on 400 degree hot oven until browned and potatoes are cooked around 30 minutes. oh my this souds good! 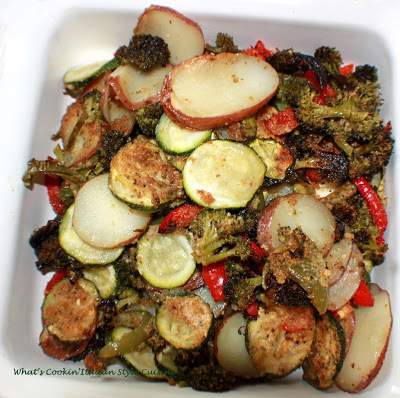 I LOVE roasted vegetables, although i've never tried it yet with parmesan and breadcrumbs. Im gonna try that out next time :) thanks for sharing! These vegetables sound delicious. The breadcrumbs add another layer of flavor and texture to roasted veggies. I feel the same way....never thought to add the bread crumbs! Except for the odd occasion when I have chocolate for dinner, I am manic about heaps and heaps of vegetables. Love the crunch from the bread crumbs and the bits of oozing melted cheese. I love a big plate of vegetables. Just looking at that dish makes me want one of my own. Girl, you set my mouth to watering. Yum!!! Claudia, I really love your roasted vegetables...especially with the addition of the Parmesan cheese and the bread crumbs. Such a comforting dish, even by itself. So good and totally scrumptious! OMG Claudia, This dish looks scrumptious!! My kind of food!